Caution: Eye And Skin Irritant. Keep Out Of Reach Of Children. Read Precautions On Back. Important. Risk Of Electrical Shock. This Product Is Not A Toy. Intended For Adult Use Only. Use Warmer Only In Properly Functioning 120 Volt Electrical Outlet. Do Not Use With Extension Cords. Do Not Place Fragrance Oil Both Or Cap On Finished Wood Surf Aces Or Place Any Object Within 12" (30 Cm) Above Warmer. Do Not Plug Anything In Above It. Do Not Disassemble Or Modify Unit In Any Way. 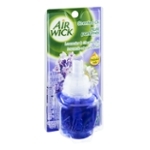 Only For Use With Air Wick?? Air Freshener Warmers. Keep Out Of Reach Of Children. Caution: Eye And Skin Irritant. Prolonged Or Frequent Skin Contact May Cause An Allergic, Reaction. Avoid Contact Wt Eyes, Skin And Clothing. Do Not Ingest. First Aid Treatment: If In Eyes, Rinse Eyes With Water. Remove Any Contact Lenses And Continue To Rinse Eyes For At Least 15 Minutes. If On Skin, Wash Area With Soap And Water. If Irritation Persists, Get Medical Attention. Discontinue Use Immediately And Get Medical Attention If A Reaction Develops. If Swallowed, Do Not Induce Vomiting. Call A Physician Or Poison Control Center Immediately. Contains Fragrance Oils. Wash Hands After Handling.